As usual on the first morning we woke up really early! 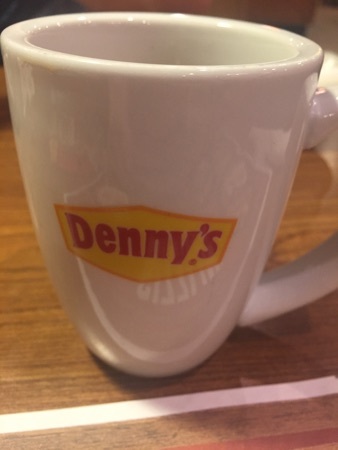 3.30am to be exact, we got ourselves ready and decided to head out to Denny's for breakfast. It's a 2 minute drive down to crossroads which is going to be great for meals! We arrived at 5.30 and were the only people in there. DH and I ordered a coffee each and DD had a chocolate milk. 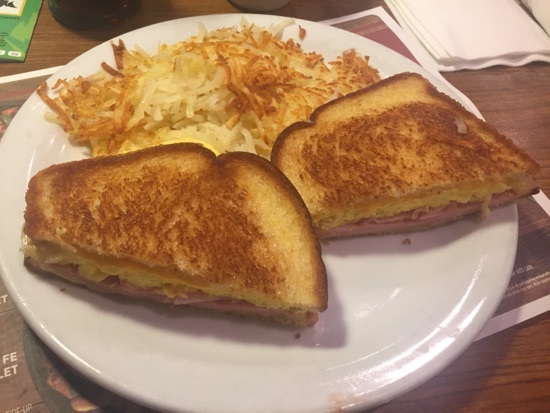 I ordered my usual moons over my hammy with hash browns. This was as good as I remember, there was loads of ham, cheese and eggs and it was so moist. 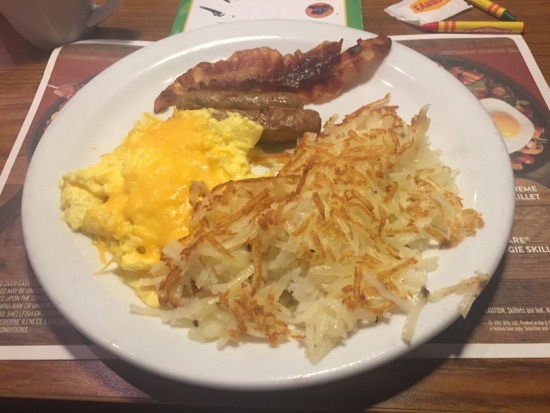 DH had the all American slam breakfast, this came with a side of pancakes, he really enjoyed this. The hash browns were perhaps a little on the undercooked side, i prefer more of it to be crispy but still tasted good! 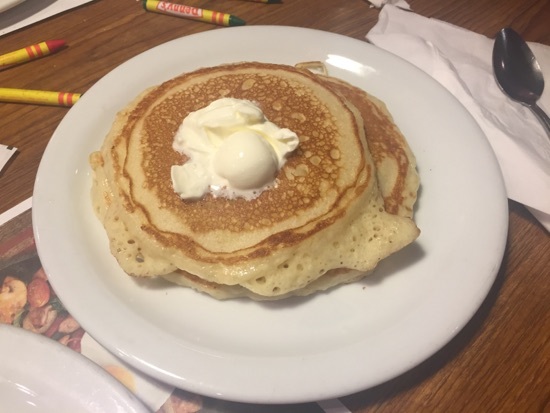 The pancakes came served with butter and they brought out a huge bottle of maple syrup to pour on yourself. 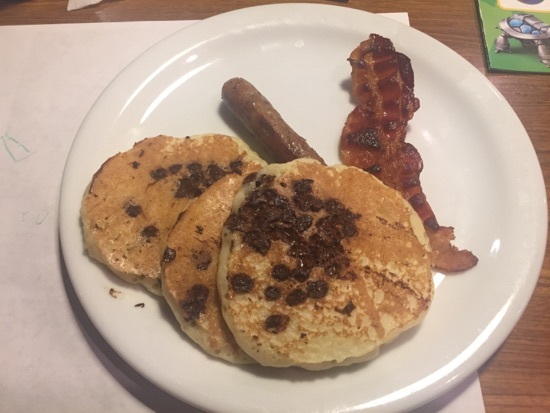 DD had the kids chocolate chip pancake breakfast. She really enjoyed the pancakes, especially when she tried them with maple syrup! 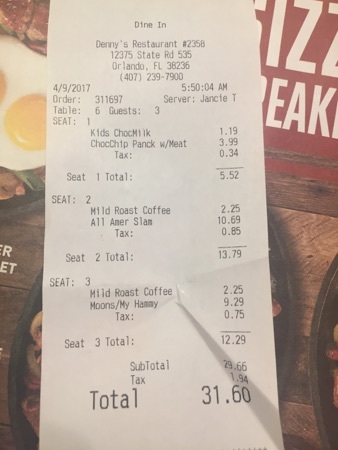 The bill came to $31.60. 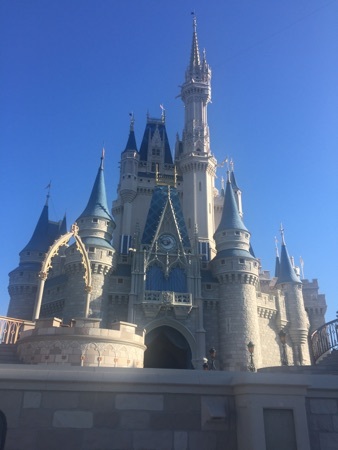 Today's plan is as usual on the first day... Magic Kingdom! So we headed to MK and watched the new welcome show at the castle. We had fastpasses for buzz light year, seven dwarfs mine train and the tomorrowland speedway and also managed the barnstormer, carousel, Winnie the Pooh and dumbo before lunch. We had an early lunch at caseys corner. 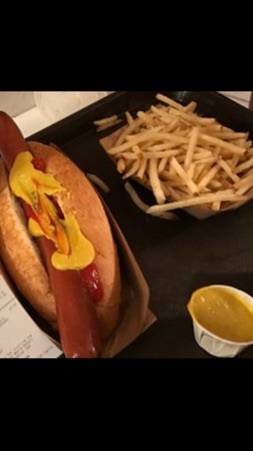 We got the footlong hotdog meal to share. This is my first photo fail, we'd started before I remembered to take a photo. This was really tasty! 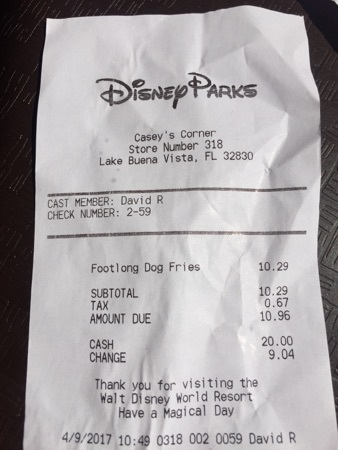 The fries were really good, different from the usual Disney fries and the hotdog sausage was like proper sausage rather than the usual over processed sausage. This came to $10.96 including tax and was just right shared between three of us as it left room for dessert! We headed across to the plaza ice cream shop where we got the all American sundae to share. 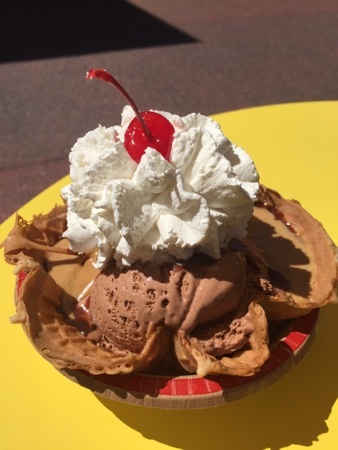 This was a scoop of chocolate and a scoop of cookies and cream ice cream in a waffle bowl topped with hot fudge sauce and whipped cream, we also added an extra topping of peanut butter sauce. This came to $6.91 with tax and the extra topping. It was absolutely amazing especially with the added peanut butter! It was huge and just right between the three of us! After this we managed further fastpasses for rapunzel and Tiana, the teacups, the barnstormer, dumbo and seven dwarfs mine train. For dinner we decided on Buffalo Wild Wings at crossroads. 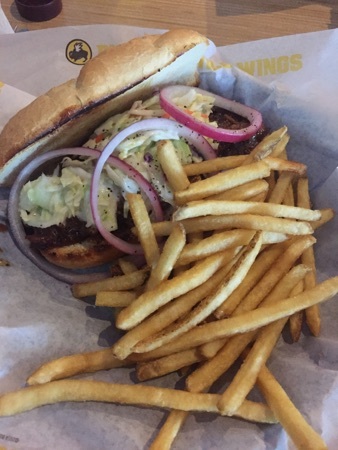 I had the pulled pork sandwich. This was really good, there was plenty of pork and it was really sloppy with plenty of sauce. My one criticism would be it was a little on the salty side and I love salt! The fries were good too. DH had the buffalo blue burger. 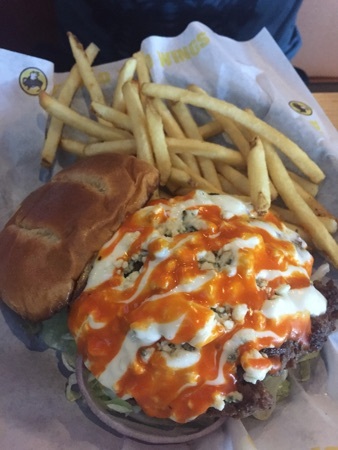 This was a beef burger topped with blue cheese and buffalo sauce. This was also really tasty, DH finished it in no time! The buffalo sauce had quite a kick to it but this was offset by the blue cheese. 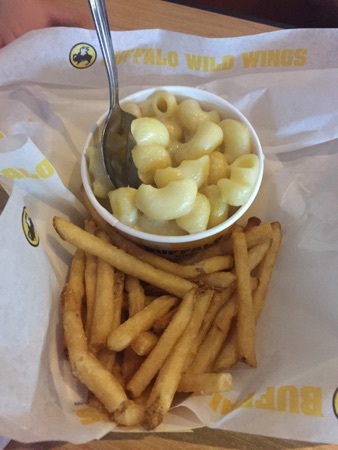 DD had the kids Mac and cheese with fries. This wasn't anything special, just regular pasta in a basic cheese sauce. 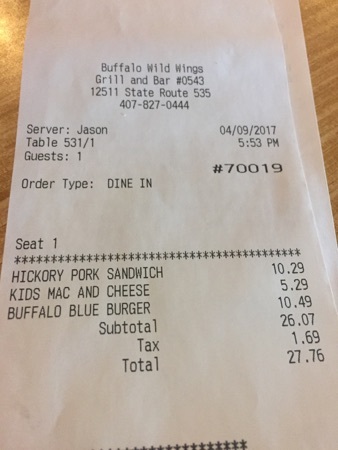 The bill came to $27.76 which we thought was great value. They have some pretty good happy hour deals on Monday-Friday until 7pm so we plan on returning! Ooohh that sandwich looks fab. Love that first day feeling and early morning start. Breakfast looks yummy. Enjoy MK. Looking forward to reading the rest. I love the first morning. New Photo Added by missdopey - 9 Apr 17 11:26 PM.